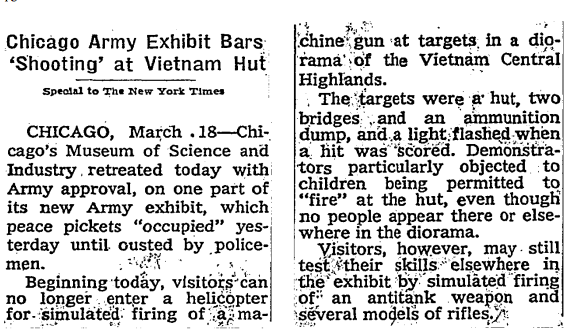 In books and interviews, Noam Chomsky recalls that during the Vietnam War a diorama of a Vietnamese village was built at the Chicago Museum of Science where "children were supposed to come and play, and shoot at the village with the guns". There was in item in the New York Times that described an event that took place in Chicago. The Chicago Museum of Science, which is a very respectable place, had put up an exhibit. The exhibit was a Vietnamese village, sort of a diorama of a Vietnamese village, and around it there were guns, and children were supposed to come an play, and shoot at the village with the guns. That was the game. Power and Terror: Conflict, Hegemony, and the Rule of Force, by Noam Chomsky, John Junkerman, Takei Masakazu. Available on Google Books. or see this interview with Chomsky on Youtube. It also reports that the New York Times published an article criticising a group of mothers protesting outside the museum. However, I can not find any other sources that confirms the facts. Is Noam Chomsky's version of the events accurate? The exhibit and the protesting was widely reported in newspapers at the time, including the NYT, which seems to have had at least two articles about it. Part of a U. S. Army display at the Museum of Science and Industry in Chicago is this realistic, self-service war studio. In this news photo a 14-year-old boy is aboard the real "Huey" armed helicopter, firing a 7.62 millimeter machine gun at targets on a backdrop. Visitors to the museum are able to test their marksmanship electronically as they hit targets on what is a view of the Central Highlands in Vietnam. This is the ultimate in vicarious thrills killing Vietnamese from a hovering helicopter. This is real conditioning for embryo warriors, far more effective than the art of the toy makers. This goes beyond jingoism. It exhibits a lack of conscience. This is an insane Disneyland! 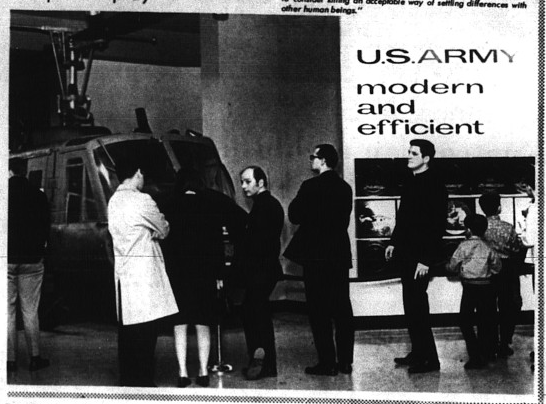 The question of a demonstration over it aside, it is little short of incredible that the Army would have had the gall to construct the exhibit that ended up in the Museum of Science and Industry in Chicago. On display at the museum is a "Huey" troop-carrying helicopter equipped with a machine gun with which visitors can simulate firing at a painted target of thatched hut. Flashing lights indicate a hit. According to news dispatches, the display has been popular with children. What motivated the army — if indeed it is thinking at all these days — to use tax funds, or any funds, for such a project is something that is probably just well left unexamined. Suffice it to say that our nation has already become enough of a military state that we do need anything to add encouragement to that trend, especially an army-financed game of which youngsters can say: "Hey, let's go down to the museum and shoot up an Asian village." They will probably have their chance to do that for real all too soon. What next? 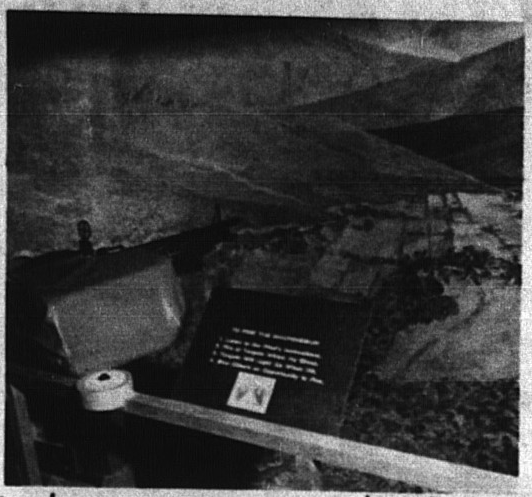 A U.S. Army display in the Museum of Science and Industry in Chicago permits a visitor to climb into a Huey helicopter and fire electronic machineguns into a mockup of a Vietnamese village. A direct hit is recorded by a bright burst of light simulating a fire and explosion. A fun-and-games approach to the Vietnam tragedy is out of step with the current of anguish pulling at the heart of America. It is shocking even to hardened human sensibilities that such a display would be included in a U.S. Army exhibit of weapons used in Vet-nam. Will the next shooting gallery idea and replace the moving bear target with a Viet Cong that turns around and runs the other way when a direct his is recorded? Has the American sense of proportion about death and destruction gotten so far out of kelter that displays permitting civilians to get a feel of the almost real thing will be accepted by the public without a protest? We don't think so. We believe there are many Americans who share with us a sincere hope that the Army will fold its exhibit tent and steal quietly away. Anyone who wants to know what it feels like to shoot up a Vietnamese village can ask a returning American serviceman. They have the full story. 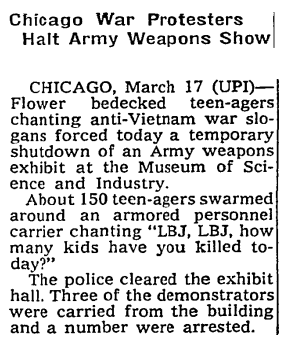 Flower bedecked teen-agers chanting anti-Vietnam war slogans Sunday forced a temporary shutdown of an Army weapons exhibit at Chicago's Museum of Science and Industry. About 150 of the teen-agers swarmed around and onto an armored personnel carrier, shouting, singing and chanting, "LBJ, LBJ, how many kids have you killed today?" Police moved in and cleared the exhibit hall, warning any who tarried they would be arrested. Officers carried at least three demonstrators from the museum. Six persons were taken into custody and hauled to Central Police Headquarters, where they were being questioned. It was not immediately determined whether the demonstration inside the hall was linked to the picketing outside the museum by an estimated 300 representatives of two schools and two peace groups. If one has to be arrested in a demonstration, we can think of few better causes than the "sit-in" at the Chicago Museum of Science and Industry this week. An Army exhibit there included a helicopter equipped for simulating firing of a machine gun at targets in a diorama of the Vietnam Central Highlands. The targets included a hut, two bridges and an ammunition dump. A light flashed when a hit was scored. Some youngsters apparently found it great sport. On Monday, some 150 pickets "infiltrated" the exhibit, some occupying the helicopter, others sitting on the floor to prevent people from entering the exhibit. Outside, another 300 pickets handed out antiwar handbills and carried signs such as, "Don't teach your child to kill." Police removed those inside the building, arresting six. But the helicopter simulated firing has been ended. At the rate we're going, our youngsters will be firing down on Vietnamese villages from helicopters soon enough. We see no need to advance the timetable with simulated war in museums. Another account, mostly describing a man who was protesting while carrying his child can be found in the Columbia Missourian. Not the answer you're looking for? Browse other questions tagged vietnam-war .